The mountain laurel is an ericaceous evergreen shrub with delicately ornate white to pink flowers. In addition to being one of the harbingers of spring and summer with its late May bloom time, the mountain laurel is Pennsylvania’s official state flower. 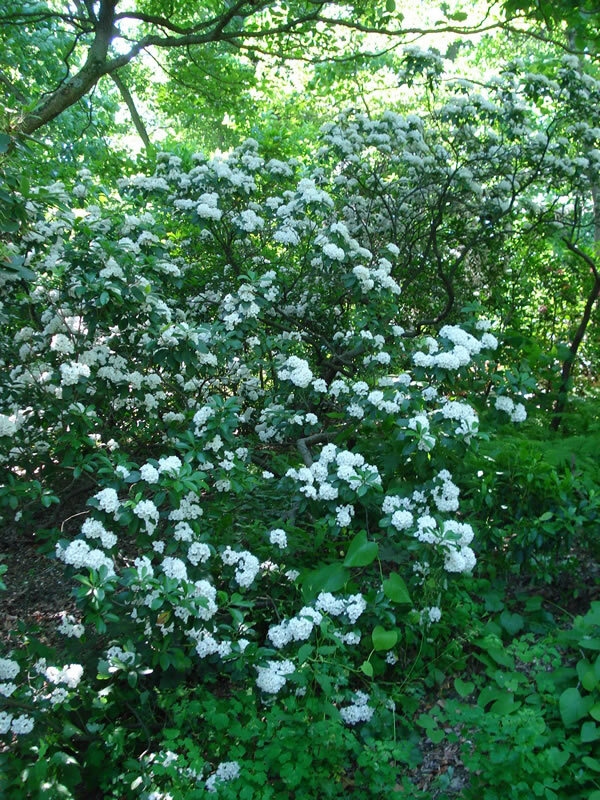 These shrubs grow 4-10 feet tall with a typical spread of 4-5 feet. Along with the attractive flowers and evergreen foliage, mountain laurels also have very interesting form with a gnarled trucking pattern and dark bark that can be considered ornamental in its own right. While mountain laurel is an evergreen shrub that provides year-round interest with its form and foliage, it is not densely evergreen, and is typically used more as an accent than a screen. The native range of the mountain laurel extends across the Eastern United States from Maine to Mississippi. They enjoy rocky, acidic soil that is moist with good drainage, but will also tolerate drier soil. Although wild mountain laurels can be found in the native woodland in large groves that sweep across deeply shaded hillsides, they are not aggressive and will not likely seed around your garden. 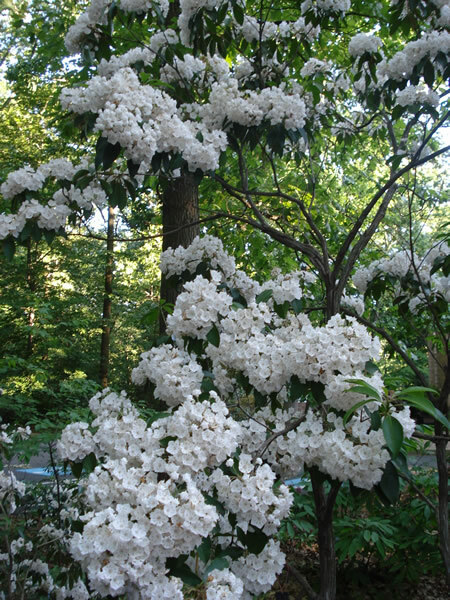 Mountain laurels will grow in sun or shade and are fairly low maintenance. Pruning dead branches and removing old flower heads will give the plant a more tidy appearance, but is not necessary. While many wild birds use Mountain Laurels as a source of food, this plant is poisonous to humans.